The Humble Frozen Synapse Bundle has wrapped up with more than $1.1 million in sales. 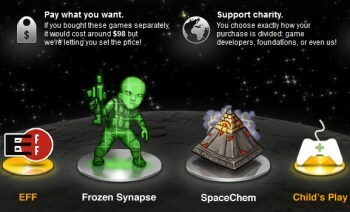 Like all the previous Humble Bundles, the Humble Frozen Synapse Bundle was a hell of a deal. Frozen Synapse, the Humble Frozenbyte Bundle (Trine, Shadowgrounds, Shadowgrounds Survivor, Splot and Jack Claw), SpaceChem and Trauma, all for less than you'd pay for a half-assed workday lunch. That's $4.81, by the way, which turned out to be the average price paid for the bundle and the cutoff cost for all the extras. A few other statistics of note: 231, 799 copies of the HFSB were purchased, roughly two-thirds of them by Windows gamers and the remainder split fairly evenly between the Mac and Linux crowds. Linux gamers paid the highest average price at $9.61, followed by Mac owners, who ponied up an average of $6.95, and finally the Windows cheapskates, who as usual brought up the rear with a sub-average $4.13. It all adds up to a grand total of $1,115,350.13, not a bad haul by any stretch but still the second-lowest-seller of all the Humble Bundles, beating only the Humble Frozenbyte Bundle, which didn't quite make the $1 million mark. Not that that's terribly surprising; it was a fantastic deal for Frozen Synapse, which normally goes for 25 bucks on its own, but if you weren't interested in that and you'd already shelled out for the Frozenbyte bundle, there wasn't a whole lot else to bring your boys the yard. Congratulations to all involved for making the fourth Humble Bundle another big success. If you'd like to be kept up to date about future Humble Bundle happenings, you can add your name to the list at humblebundle.com.